Students from more than 125 area schools comprise the four orchestras of the 56-year-old organization, dedicated to providing enhanced musical experiences and free concerts throughout the metropolitan area. The Youth Symphony of Kansas City was incorporated on July 31, 1958 under the direction of conductor Leo Scheer. The organization initially consisted of one orchestra with 80 musicians. Five weeks later, the group presented its first concert and Mayor H. Roe Bartle proclaimed the week as “Youth Symphony Week.” In 1964, the organization added a younger orchestra, the “Junior Youth Symphony,” due to increased demand. In 1991, a third orchestra was formed. Today, there are four orchestras to accommodate talents from students in late elementary through their senior year in high school. Executive Director Steven C. Murray has been with the organization since late 2010 and helps oversee the program’s four full orchestras which are graded progressively based on the students’ ability level as demonstrated in the annual audition process. The orchestras are: Symphony Orchestra, an advanced ensemble comprised of students in grades 9-12 conducted by Steven D. Davis; Academy Orchestra, an advanced ensemble with students in grades 8-12 conducted by Russell E. Berlin, Jr.; Philharmonic Orchestra, an intermediate orchestra with students in grades 7-11 conducted by Michelle Davis; and Symphonette Orchestra, a preparatory orchestra for students in grades 5-9 co-conducted by Scott Kuhlman and Dr. Carrie Turner. In mid-May of this year, more than 515 students took up the chance to audition for one of the four orchestras. Each year, no matter the previous year’s placement, all student musicians must audition. About 390 students are placed among four orchestras. Berlin worked as an instrumental teacher in the Lee’s Summit R-7 School District where he taught elementary, junior high and two senior high classes in his career. Berlin has received many honors, including the Excellence in Teaching Award given by Lee’s Summit Chamber of Commerce, the Missouri School Music Educator of the Year Award given by the Missouri Chapter of the American String Teachers Association and the Silver Shoe Award given by Lee’s Summit North High School for significant contributions to the students and staff of Lee’s Summit North High School. The capstone is to play at the Kauffman Center for the Performing Arts, especially for the seniors. The spring 2015 concert will again be at the Kauffman Center and will feature both Academy and Symphony Orchestras. 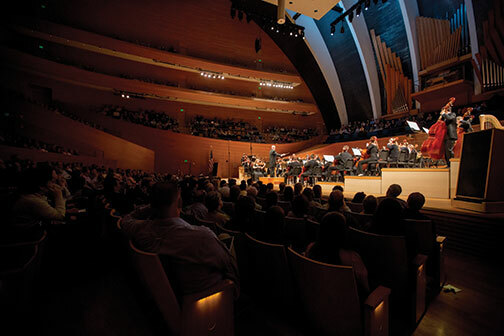 The Symphony Orchestra played the first concert at the Kauffman Center’s open house. “We also performed at the groundbreaking,” Murray says. Berlin figures the exposure will also exhibit the professionalism of the conductors and the musicians. “We get to share the quality of what we produce here.” Murray expects the orchestral organization to be distinctively prepared for the future. “We are uniquely poised to be a catalyst offering positive social change through music. We can provide the underserved with hands-on music education. It is incumbent on us to understand the opportunities to serve those needs.